To investigate the difference in the optic canal diameter between children with autosomal recessive malignant infantile osteopetrosis and normal children, and to assess the influence of hematopoietic stem cell transplantation on the optic canal diameter. Twenty pediatric patients with malignant infantile osteopetrosis and 22 normal control children were included in this study. Eleven patients with malignant infantile osteopetrosis underwent hematopoietic stem cell transplantation. The measurements included optical canal diameter and flash visual evoked potential. Comparisons of these measurements between patients with malignant infantile osteopetrosis and normal controls as well as before and after hematopoietic stem cell transplantation were performed. The correlation between age and optic canal diameter was analyzed using Pearson correlation analysis. The mean optic canal diameter before hematopoietic stem cell transplantation was 1.65 ± 0.54 mm in patients with malignant infantile osteopetrosis and 3.38 ± 0.60 mm in the control group (P < .001). The mean optic canal diameter after hematopoietic stem cell transplantation was 2.72 ± 0.66 mm, which was significantly different from the pre-transplantation measurement (P < .001). The P2 latency for the flash visual evoked potential after hematopoietic stem cell transplantation (152.3 ± 36.4 ms) was significantly less than that before transplantation (165.5 ± 27.7 ms; P = .051). Pearson correlation analysis revealed a significant correlation between age and optic canal diameter (r = 0.722, P < .001). The optic canal was narrower in pediatric patients with malignant infantile osteopetrosis than in age-matched normal controls. This condition can be relieved through hematopoietic stem cell transplantation and the impaired conductibility of the optic nerve can be improved in some cases. Currently, allogeneic hematopoietic stem cell transplantation (HSCT) is the only effective and radical approach for treating some patients with malignant infantile osteopetrosis. The European Bone Marrow Transplant collaboration performed a retrospective analysis in 122 patients with malignant infantile osteopetrosis who underwent HSCT and found that the 5-year event-free survival rate following human leukocyte antigen–matched HSCT was as high as 73%.5 In contrast, the survival period of patients with malignant infantile osteopetrosis is usually less than 6 years, and the mortality is up to 70% if left untreated.6–8 Measurement of the optic canal diameter before HSCT is feasible for assessing the decompression of the optic canal and helping hematologists choose the optimum opportunity for transplantation. However, relevant studies regarding the perioperative dynamic development of the optic canal are sparse, and the identified studies were limited to case reports. Furthermore, given the limited sample sizes in previous case reports, the age-related confounding factors associated with the development of the optic canal cannot be excluded. In 1970, Harwood-Nash9 first measured optic canal diameters and reported a mean value of 4.3 mm in 14 children younger than 1 year by x-ray imaging. In 2009, Barry et al.10 used computed tomography (CT) scanning to quantitatively measure the optic canal diameter in 60 normal children younger than 2 years and reported a mean value of 3.15 to 3.44 mm. CT findings in a small-sample study performed by our team11 in 2013 showed changes in the optic canal before and after HSCT in infants with malignant infantile osteopetrosis. The optic canals in pediatric patients with malignant infantile osteopetrosis treated with HSCT were significantly widened; however, the outcome of flash visual evoked potential (FVEP) was only recorded qualitatively. In the current study, we continued to use three-dimensional (3D) CT imaging and a visual electrophysiological technique with a larger sample size to compare the optic canal diameter in children with malignant infantile osteopetrosis to that in normal healthy children in China, with statistical analysis to eliminate the influence of age at neural tube development. Moreover, the optic canal diameter and visual function before and after HSCT were compared. The purpose of this study was to objectively analyze changes in the optic canal opening and conductibility of the optic nerve following HSCT in patients with osteopetrosis. Twenty patients with TCIRG1-related malignant infantile osteopetrosis who were referred to Beijing Children's Hospital between June 2006 and December 2015 (malignant infantile osteopetrosis group) and 22 normal, healthy children younger than 4 years (control group) were enrolled in this study. The radiological profiles in the control group were collected for assessing lacrimal development or previous head trauma, and the medical records confirmed the absence of a metabolic or developmental abnormality or any other cause of osteopetrosis. Institutional review board/ethics committee approval for human studies was obtained from Beijing Tongren Hospital and Beijing Children's Hospital, Capital Medical University, China. The study was conducted in accordance with the tenets of the Declaration of Helsinki, and informed consent forms were signed by the children's parents or guardians. Data for orbital 3D-CT reconstruction were collected for all children, using bone-window parameters and a layer of thickness less than 2 mm. The optic canal diameter was measured by two radiologists independently and reviewed by the third radiologist. All children were examined by high-resolution CT scanning using the Discovery 750 (GE Healthcare, LLC, Waukesha, WI). Because younger children have difficulty cooperating with examinations, they were given oral 10% chloral hydrate sedation (0.3 to 0.4 mL/kg) before CT scanning. Children were in the supine position with a cushion under their heads. Axial scanning was used, and the reconstruction was multiplanar reconstruction. The scanning parameters were as follows: tube volt = 80 kV; pitch = 1.375; depth = 1 mm; interlamellar spacing = 1 mm; and a 256 × 256 matrix. Final image results were transferred to the GE AW4.6 CT workstation for further analysis. We always followed the principle of low-dose radiography for children, and the mean CT ray dose was 1.09 ± 0.02 mGy in our study, far below the standard for CT radiation to the adult head developed in the United States. FVEP was examined using a visual electrophysiology system (Roland Inc., Brandenburg, Germany). The standard FVEP protocol recommended by the International Standard EEG 10–20 System was followed: the examination was performed in a dark room, the electrodes including the active, reference, and ground electrodes were placed, and the eyes were stimulated by a mini hand-held stimulator separately and repeated twice per eye, with more than 70 superposition times. The excitation frequency was set at 30 Hz. All statistical analyses were performed using SPSS software (version 13.0; SPSS, Inc., Chicago, IL). The correlation between age and optic canal diameter was analyzed by Pearson correlation analysis. We used covariance analysis to analyze the difference between the mean diameters in the two groups. The mean optic canal diameters, P2 latency period, and amplitude of FVEP were measured before transplantation and 1 to 2 years after transplantation in the 11 children who gained hematopoietic reconstitution, and data for these parameters were compared using the paired t test. A P value of less than .05 was considered statistically significant. The patients in the malignant infantile osteopetrosis group included 5 girls and 15 boys between the ages of 0.2 and 26 months, and the control group included 8 girls and 14 boys between the ages of 3 and 40 months. These 20 cases included 6 cases (30%) with good fixation ability and 14 cases (70%) with poor fixation ability, including 3 cases (15%) with strabismus and 4 cases (20%) with nystagmus. Among the 20 cases, there were 3 cases (15%) of facial nerve palsy and 7 patients (35%) with optic atrophy. A total of 14 children underwent HSCT (age range: 5 to 31 months, mean: 14.6 months); 11 of them gained hematopoietic reconstitution and 3 died of implant failure. Two children abandoned transplantation, and 4 were scheduled on the waiting list for HSCT. The children were followed up over 1 to 6 years. 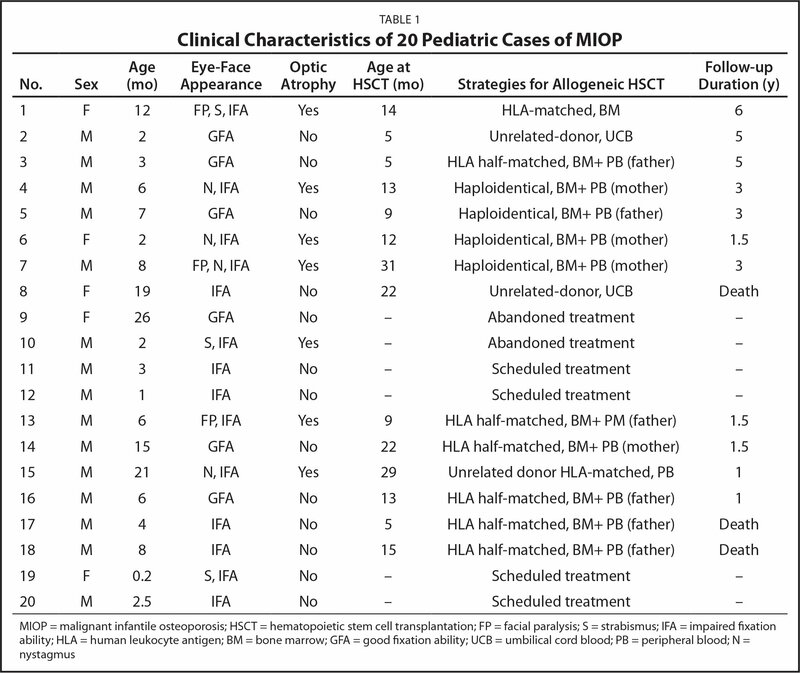 The clinical characteristics and treatment strategies for these 20 children with malignant infantile osteopetrosis are summarized in Table 1. X-ray imaging showed that children with malignant infantile osteopetrosis had increased bone density, texture disappearance, occlusion of the medullary cavity, and thickened vertebral plates appearing as a cream-like change. From the fourth or fifth month after HSCT, the bone mineral density decreased gradually, and medullary regions were visible in bones. The mean optic canal diameter in the control group was 3.38 ± 0.60 mm. 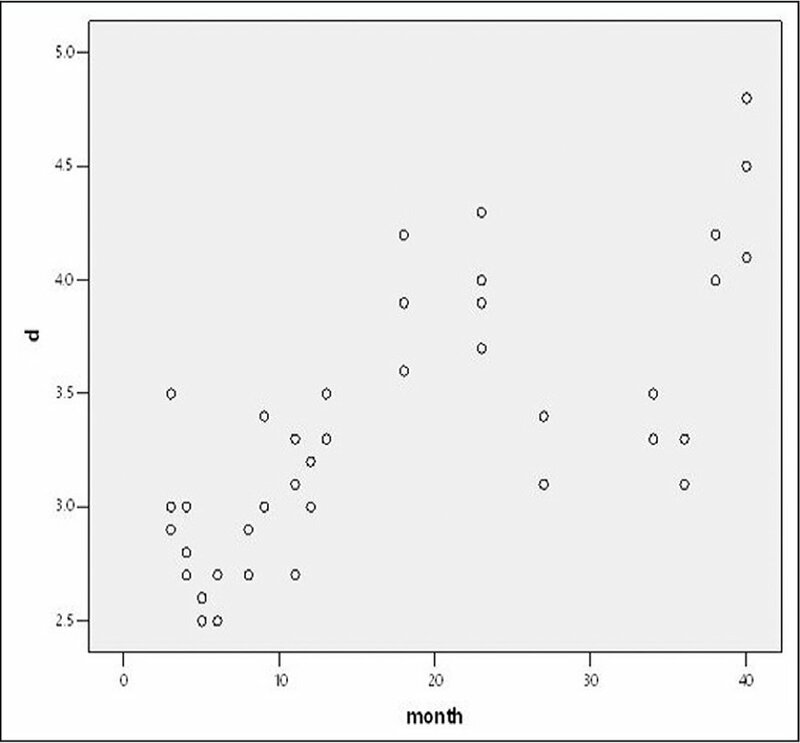 Pearson correlation analysis revealed a significant correlation between age and optic canal diameter (r = 0.722, P < .001; Figure 1). 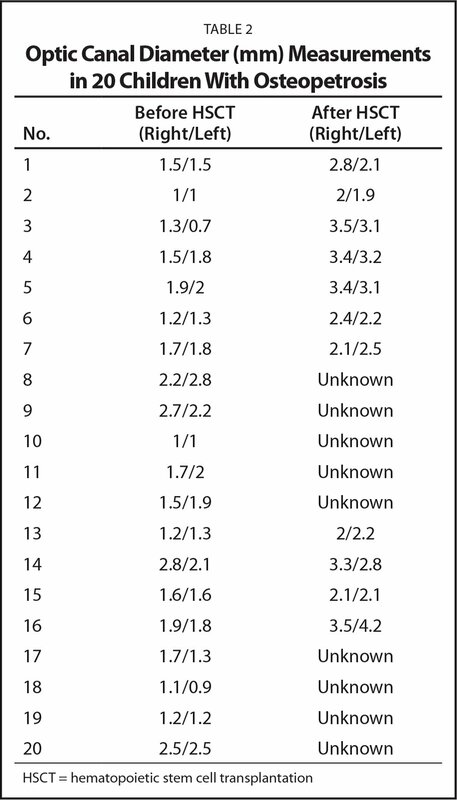 The mean optic canal diameter in the 20 malignant infantile osteopetrosis cases before HSCT was 1.65 ± 0.54 mm, and increased to 2.72 ± 0.66 mm in 11 cases 1 to 2 years after HSCT (Table 2). Figure 2 shows the gradual opening of the optic canal in the same patient 2 years after transplantation. Furthermore, the outcomes presented in Table 3 displayed that the influence of age variables had been eliminated by covariance analysis. The optic canals in the malignant infantile osteopetrosis group were significantly narrower than those in the control group (P < .001). The comparison of mean optic canal diameters before HSCT and 1 to 2 years after HSCT in the 11 children who received successful hematopoietic reconstitution revealed that the mean optic canal diameter was significantly increased after HSCT (P < .001). Scatter diagram showing the significant correlation between age and optic canal diameter. Computed tomography scans show the changes in optic canal diameters before and after hematopoietic stem cell transplantation. The optic canal was (A) narrow before transplantation and (B) wider 2 years after transplantation. The mean P2 latency period for FVEP before treatment was 165.5 ± 27.7 ms and the mean amplitude was 9.80 ± 8.78 µv, which indicated blockage of the optic nerve conduction and obvious impairment of visual function. For at least 6 months after HSCT, the P2 latency period appeared to be decreased to 152.3 ± 36.4 ms and the amplitude increased to 11.03 ± 8.23 µv. This shortening of the P2 latency period was almost significant (P = .051); however, the increase in amplitude was not obvious (P = .542; Figure 3, Table 4). Comparison diagram of flash visual evoked potential in patients with osteopetrosis before and 6 months after transplantation showed that the (A) pre-treatment P2 latency period was prolonged and (B) post-treatment P2 latency period was significantly reduced. Osteopetrosis is a heterogeneous disease, and the heterogeneity stems from the causal genes, modes of inheritance, and disease severity/phenotypes. T-cell immune regulator 1 (TCIRG1, Gene ID: 10312, OMIM No. 259700) is one of the main genes responsible for the majority of malignant infantile osteopetrosis cases, which have a severe phenotype including bone marrow failure resulting in pancytopenia, hepatosplenomegaly, blindness secondary to optic nerve compression, hydrocephalus, and other neurological dysfunction at an earlier onset of age 12 years. In this study, we compared the optic canal diameter of children with malignant infantile osteopetrosis with that of normal controls, and the influence of HSCT on the optical canal in children with malignant infantile osteopetrosis using orbital 3D-CT reconstruction. We found a positive correlation between the optic canal diameter and the onset age. Our results indicated that after excluding the age factor by covariance analysis, the optic canal diameters in patients with malignant infantile osteopetrosis were significantly narrower than those of normal controls, and that HSCT could inhibit the progressive stenosis of the optic canal. Although the patients who underwent transplantation would be on average older than patients prior to transplantation, they had significantly wider optic canals than same-age children who had not received or refused HSCT (8 pre-transplantation cases, 21 to 48 months old with a mean optic canal diameter of 1.94 ± 0.79 mm, unpublished data). This finding proves that transplantation does promote opening of the optic canal. Optic canal diameter measurement using CT scanning may be an effective approach for evaluating the optic canal compression of malignant infantile osteopetrosis. To the best of our knowledge, there is no quantitative study in the literature regarding the change in the optic canal diameter before and after HSCT. As to visual outcomes of patients with malignant infantile osteopetrosis following HSCT treatment, a consensus has not yet been reached. Kerr et al.14 described an 8-month-old infant with malignant infantile osteopetrosis who underwent HSCT, in which CT imaging confirmed expansion of the optic canal at 6 months after transplantation and the visual progressive impairment was controlled. However, Gerritsen et al.15 found that the visual dysfunction in 87% of patients could not be improved even after HSCT. In a retrospective study, Driessen et al.5 analyzed the visual outcomes in 122 children with malignant infantile osteopetrosis who underwent allogeneic HSCT and found that visual function could be preserved in 48% of children within 3 months of age, 52% of children within 4 to 6 months of age, and only 14% of children older than 6 months. In addition, 24% of children experienced progressive visual impairment following HSCT. In the larger sample of malignant infantile osteopetrosis cases treated with HSCT (193 cases), Orchard et al.16 found that among 73 cases with vision follow-up after transplantation, 9.6% of patients had improved visual acuity, whereas 70% of cases experienced a progressive decline in visual acuity, even though HSCT had been successful. Therefore, some authors17,18 hypothesize that, in addition to the abnormal optic canal anatomy, some genotypes of infants and malignant infantile osteopetrosis subgroups have primary retinal degeneration and/or associated systemic neurodegenerative disease, characteristics of neuronal ceroid lipofuscinosis. Neuronal ceroid lipofuscinosis is a progressive encephalopathy of human genetic heterogeneity that manifests as neurocognitive and motor decline, severe visual impairment, and ultimately premature death. Knockout of the CICN7 gene loci in a rat model19 showed that visual impairment and retinal degeneration resulting from compression of the optic nerve and consequent atrophy are two separate, independent events. Importantly, although HSCT can successfully correct bone and blood abnormalities, it does not reverse the progression of neurodegenerative diseases. VEP can provide early clues for visual pathway disorders, and the electrophysiological changes are more sensitive than radiological abnormalities. In the current study, we used FVEP to evaluate the optic nerve conductibility of children with malignant infantile osteopetrosis. Before transplantation, the P2 latency period of FVEP was prolonged and the amplitude was decreased in all 11 children. 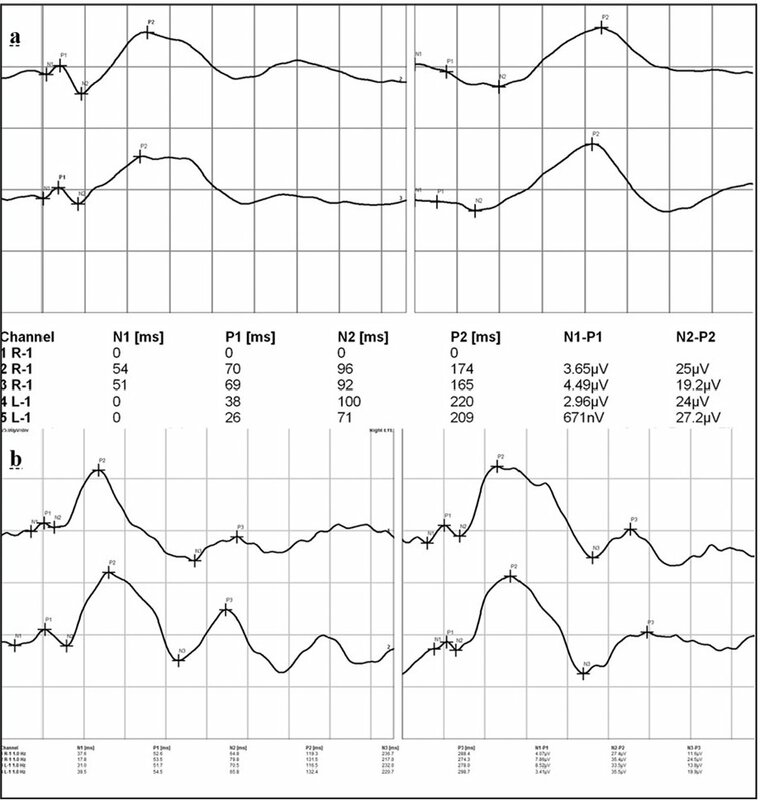 After transplantation, the P2 latency of FVEP was significantly shortened, indicating that the optic nerve conduction block was alleviated in some patients. However, we also noticed that the above value in some cases did not change, or even deteriorate, such as in cases 4 and 6, and the increased amplitude in most cases was not obvious. Thus, we suspected that in some cases the optic nerve conductivity may have been slightly improved, yet in others the damage had already occurred. Future research is needed to determine whether primary retinal degeneration was present in these cases. This study applied orbital 3D-CT reconstruction to quantitatively analyze optic canal stenosis in children with malignant infantile osteopetrosis. We compared the optic canal diameters of patients with malignant infantile osteopetrosis with normal controls and evaluated optic nerve conductibility. Although other studies have not reached the same conclusion, our findings indicated that the optic canal in patients with malignant infantile osteopetrosis is significantly narrower than that in normal children, and successful HSCT can relieve the progressive optic canal stenosis and control the deterioration of visual function impairment. Early HSCT is associated with favorable prognosis. Orbital 3DCT reconstruction and visual electrophysiological examination are effective methods for assessing the optic nerve damage in malignant infantile osteopetrosis and also helpful in the evaluation of the optic nerve before and after transplantation. Colonia AM, Schaimberg CG, Yoshinari NH, Santos M, Jorgetti V, Cossermelli W. Osteopetrosis: report of 2 cases and review of the literature. Rev Hosp Clin Fac Med Sao Paulo. 1993;48:242–247. Gerritsen EJ, Vossen JM, van Loo IH, et al. Autosomal recessive osteopetrosis: variability of findings at diagnosis and during the natural course. Pediatrics. 1994;93:247–253. Cao WH, Yu G, Qin MQ, et al. Visual function of seven children with malignant osteopetrosis after hematopoietic stem cell transplantation [article in Chinese]. Zhonghua Yan Ke Za Zhi. 2013;49:541–546. Sobacchi C, Villa A, Schulz A, Kornak U. CLCN7-related osteopetrosis. 2007;12:1993–2018. Nahin H. Diagnosis, assessment and management of nystagmus in childhood. Paediat Child Health. 2015;26:31–36. From the Department of Ophthalmology, Beijing Children's Hospital, National Center for Children's Health, National Key Discipline of Pediatrics, Capital Medical University, Beijing, China (WC, GY, QW); Beijing Tongren Eye Center, Beijing Key Laboratory of Intraocular Tumor Diagnosis and Treatment, Beijing Ophthalmology & Visual Sciences Key Lab, Beijing Tongren Hospital, Capital Medical University, Beijing, China (WC, WW); and the Department of Children's Hematology and Oncology, Beijing Children's Hospital, National Center for Children's Health, National Key Discipline of Pediatrics, Capital Medical University, Beijing, China (MQ). Supported by the Beijing Municipal Administration of Hospitals' Ascent Plan (Grant no. DFL20150201); National Natural Science Foundation of China (Grant nos. 81570891 and 81272981); Beijing Natural Science Foundation (Grant no. 7151003); Advanced Health Care Professionals Development Project of Beijing Municipal Health Bureau (Grant no. 2014-2-003); Study on Individual Diagnosis and Therapy Strategy for Malignant Uveal Melanoma (Grant no. 2016-1-2051); Beijing Municipal Administration of Hospitals Clinical Medicine Development of Special Funding Support (Grant no. ZYLX201307); and Science & Technology Project of Beijing Municipal Science & Technology Commission (Grant no. Z151100001615052).